Oh my... this is a stunning quilt! I love everything about it and can't imagine how it must look in person. GREAT job! This is AMAZING! I love everything about it! What an awesome finish to have waiting to be quilted and quite the milestone. Congrats! What a masterpiece!! This is such an accomplishment!! oh my gosh, this is something else!! Just beautiful! Oh wow your quilt top finish is magnificent. Archie as cute as ever! great finish! I'm sure it was a lot of work, but enjoyment at the same time - now to quilting it and you will enjoy it even more. Where did you get Archie's bed? Meg could with a new one. Your hexie quilt is beautiful, so much work but so worth it. Archie's new bed (named after him, of course) is just what he needs for the sun room. That is such a beautiful quilt top. Nice work! That hexies top is lovely. I love the stained glass effect of the light coming through it, too. And the back is so neat! what a feat! Lovely! Absolutely stunning Hexy, thanks for sharing the close-ups! And Archie has made a follower out of me! The quilt looks gorgeous. I can't imagine the effort it took - and hand quilting it - you are such a patient soul. And oh, if only Archie had a twin! It's good he doesn't - that might be too much cute to handle! Oh Helen, well done!!! It has turned out so beautifully, I bet you are chuffed to bits!!! Can't wait to see it all quilted. amazing, amazing, amazing!! Truly beautiful! The twin shot is hilarious!! This is absolutely stunningly beautiful! I love it!! It's so beautiful Helen - delicate and pretty and like the most gorgeous kaleidoscope you could look through! Helen, that quilt is amazing!! Oh I bet you feel so proud... that hexie quilt makes you a hero for gorgeous, superb, completion. Take a bow! No, not a "Bow Wow wow"...Archie might think you are talking "biscuits". Well, you go girl!!! What a great hexie, the colors are devine. It will be a beautiful finish. The quilt is fantastic - I love all those different hexies! I am in awe - especially of your patience! 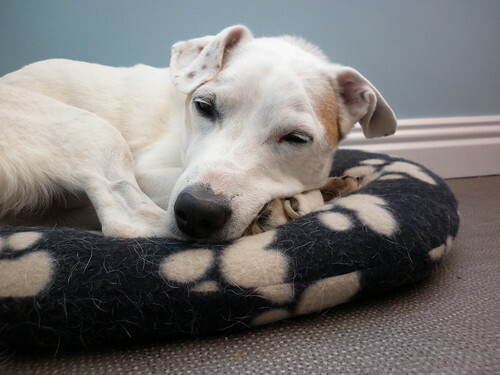 Congrats to Archie on his new bed - looks really cosy! You know how much I love this quilt but just in case I LOVE THIS QUILT! Archie reminds me of Harry Worth Showing my great age - it's black and white! Stunning Helen - are you going to hand quilt? It's just amazing. wow - it's so beautiful!!! What a labour of love, I bet you will feel lost when it's finished. I love how the patterns on the fabrics match perfectly when pieced together. Sensational accomplishment! It is just too beautiful..WOW! Congratulations! Your quilt top is fantastic! I think you should rename it Helen's Hexie Heaven. You should feel really proud of yourself because itis a fantastic achievement. Well done. Helen, this quilt is hexilicious! I've admired it from the start, and I'm so happy for you that you've completed the top. I'm looking to start a new hand stitching project. Hexies, perhaps? Congratulations!! It is absolutely stunning!! I'm just starting a project of pieced hexagons - they are such fun and there are so many different possibilities!! OK - see - this is why I love Let's Get Acquainted - it brought me to your blog - which I now love - between Archie and that Hexie quilt - awesome! I started to ask you if you had a favorite block but after I looked at the photos again - all the blocks are terrific. It is one of those quilts that you could look at for days and still see something new. Great, great job. oh my goodness, that is one gorgeous quilt! I love the light shining through the quilt top, and the blocks look so precisely pieced. just stunning! Such stunning work - your piecing is just amazing!! It is amazing! I envy your patience to sew on a quilt for such a long time but it is worth it. It looks fantastic! Oh Helen!!! It is so beautiful! You are a master. This is so stunningly beautiful. You should be so proud!! This quilt is beautiful!! I love all the different hexies! Wow - WOW, Wow, Wow - that is incredible. I would never have the patience for that. Dreamy, dreamy quilt, well done you! 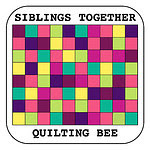 Hi just stopped by to say thanks for your lovely comment about my quilt and I found yours...it's unbelievably amazing!! You have a serious amount of patience to stick with it. 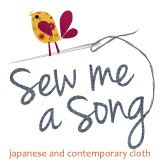 Look forward to seeing how you quilt it...good luck! This is SO COOL! It's gorgeous and I'm completely smitten! I love those photos with the light streaming through the hexies. You have done such an amazing job. Cannot believe that it is all pieced together!!! This is an amazing quit! 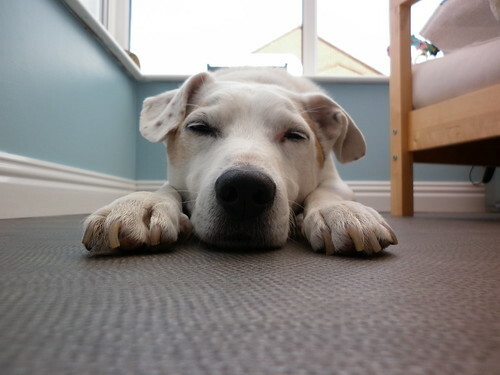 Love the pics of Archie! My Oh My ! That is some quilt! Amazing- Well done- all hand pieced incredible! I've seen your blog bandied about the place and now I can see I'll have to join the throng and follow you too! Wowee your hexi quilt is INCREDIBLE!!! And your back is soooo neat too. What a sense of achievement you must have. A wonderful masterpiece. I cannot even begin to tell you how impressed I am that you did this quilt! I would have given up at month 2, or around block 5. I so admire your perseverance. AND, it's lovely to boot!!! This is totally amazing! I've enjoyed the journey. Is it for you to enjoy once its complete? Wow! Your hexies are something else! Quite amazing! How did you cope? So much patience! Congratulations on the result. Has ARchie already lain on the plaid? Seems like his cup of tea. Have a nice weekend, and if you should get tired...you know there's something nice to huddle under (or to huddle away? this does not sound right anyway) . Together with Archie. Oh my gosh, this is stunning!!! This is amazing, you can tell that hours and hours of hard work have gone into it. I love the variety of different patterns and fabrics and the way that it fits together so well. Yay for finishing! I'm behind...and just now seeing your fabulous hexie quilt top! Great job Helen! I bet that feels wonderful. 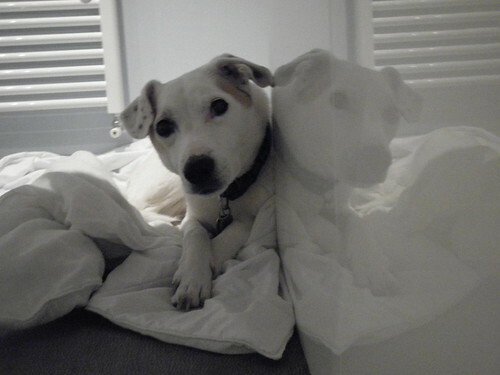 I love Archie's twin's photo and his new bed! The collar and lead post are also adorable. He is just so photogenic! That mouse pin cushion in the sewing box is adorable. Duke says hi! What a wonderful quilt Helen... and what a great read too. Archie is too cute for words...! This quilt is beyond awesome!! Can't wait to see more! 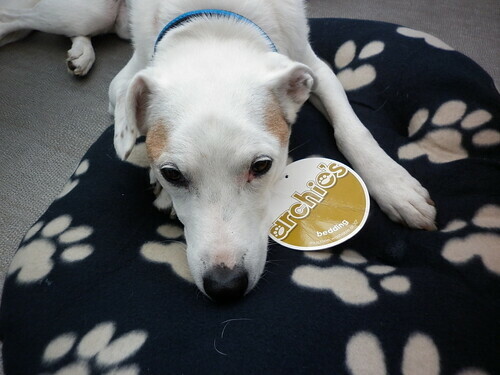 Archie is one cute fella too! Your hexy quilt top is stunning, amazing and truly a labour of love with all of that accurate hand-piecing. Well done! I see that it's all basted now and I think your thread choice and quilting line layout is just perfect. Enjoy finishing up this beautiful quilt! A stunning quilt! I love hexies and your quilt is the most stunning!